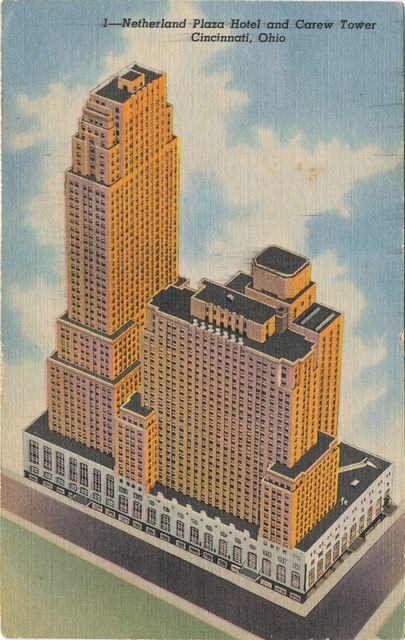 On October 25, 26 and 27 of 2012, I had the pleasure of visiting Cincinnati and was privileged to stay at the Hilton Netherland Plaza Hotel in beautiful downtown Cincinnati, Ohio. During my visit, a 16th Century Renaissance convention was taking place at the hotel which meant that about 200 PhD’s were staying in the same hotel. I learned that Amy Morris PhD, from the University Of Nebraska Omaha’s Art Department was attending the convention and staying at the Hilton Netherland, so I couldn’t resist the opportunity. I immediately contacted the Managing Director Michel Sheer, CHA since the hotel was sold out and he graciously accommodated my last minute request. Dr. Morris contacted her colleagues at the Joslyn Art Museum in Omaha and, it turns out, the Director at Joslyn is a dear friend of the American Curator at the Cincinnati Art Museum, Dr. Julie Aronson. The GM of the Hilton hosted our gathering at the hotel to follow leads and to investigate the Grell families claim that Louis Grell (1887-1960) painted the murals inside the Netherland Plaza Hotel in 1929 & 1930 for the hotel’s grand opening gala event on January 28, 1931. Dr. Julie Aronson of the Cincinnati Museum, Dr. Amy Morris from the University of Nebraska Omaha, Managing Director Michel Sheer, CHA and Richard Grell were in attendance for the tour and viewing of the hotel’s 82 year old art deco murals on October 25, 2012. If you ever get a chance to visit Cincinnati and have time to walk through this National Landmark and Historic Hotel’s of America, you will never forget it-this truly is an American Treasure! The hotel staff was incredibly kind and caring and the hotel owners have restored its magnificent 1930’s glamour and luster. Fortunately, the 18 murals that adorn the walls and ceilings are wonderfully preserved and appear as they did 82 years ago when they were first painted. Apparently, some treatment was applied to them in 1982 & 1983 when the Emery Family acquired the hotel the second time. Some members of the staff told Dr. Morris and me that a 19th mural may have been painted over in the middle of the ceiling of the 90 foot long Apollo Gallery vestibule. As you enter the side stairs to the current hotel lobby and look up you see a magnificent chandelier engulfed by two large tri-colored murals with gazelles running about and a warm sign that reads “Welcome Travelers” with a compass guiding weary travelers upstairs to their comfortable rooms so they don’t get lost and find themselves staying at a different hotel. Once you reach the top of the stairs and take a right into the massive original hotel lobby, now the Palm Court, you will find ten wall-to-ceiling French themed murals depicting the recreation which have been painted in a softer tone. Many viewers believe the artist painted images of the hotel into the background of each scene. Each mural is approximately ten feet wide by twenty feet tall and is beautifully crafted into the rounded corners and softly lighted by hidden candle-light fixtures. All are traditionally colored and keeping with the Art Deco theme found throughout the hotel. Taking another right from the Palm Court out of this very large and ornately decorated two story room, you would enter the Apollo Gallery vestibule which is ninety feet long and three stories tall. Columns support the ceiling mounted Apollo mural which is painted onto the ceiling. One is Apollo on his Chariot pulling the sun around the earth and the other is a “Hunt of Dianna” scene, both very typical of Louis Grell’s work. Just beyond the Apollo gallery is the large Continental Room which boosted a center ice skating rink and restaurant in its original design and use. It is now used primarily as a convention hall and has four, six foot by twelve foot bi-colored grayscale murals depicting the four seasons in a Greek Mythology themed manner. Unfortunately, during our tour Dr. Aronson didn’t have the chance to see the inside of the Continental room since it was in use but, in my opinion the four murals inside are classic Louie works. Thanks to the Hilton Netherland Plaza Hotel owners and Mr. Michel Sheer, I was granted permission to photograph the murals and use the pictures on this website for all to enjoy until you can plan your own visit to this beautifully preserved “gem of a hotel”. Below you will find pictures of all 18 murals that the Grell family believes Louis Grell painted and some supporting documentation.